As a parent, you notice how delicate and sensitive your baby’s skin can be. Eczema prone baby skin needs even more special attention as it is more sensitive and may become “rashy” if it gets too dry or irritated. If your baby has eczema prone skin, Dr. Amy and the Baby Pibu team want to share a few tips on how to manage eczema prone baby skin and how to prevent any baby eczema flares. Eczema is officially known as atopic dermatitis. A parent’s atopic history of eczema, hayfever, or asthma may increase a child’s risk of eczema. For the US population, eczema is rather common, affecting 10-20%. Now, don’t worry if your baby has mild eczema. Many babies can have mild cases of eczema that may just be temporary during infancy and toddler years. Eczema is a common skin condition that may have to be chronically managed over a lifetime, but it does not have to always flare. If your baby has an ill-defined red or erythematous scaly rash that affects the facial cheeks and/or the extensor (outer) sides of the arms or legs, your baby may have eczema prone skin. Not all facial rashes on a baby is eczema. Learn more about other facial rashes to distinguish. Eczema changes as your baby grows older. Eczema moves to the antecubital and popliteal areas of the arms and legs during toddler years. If you have determined that your baby has eczema prone baby skin, here are a few tips that you can do to manage it and prevent the number of eczema flare ups. Minimize bath time! Water actually dries out the skin by pulling out the skin’s natural moisture. We recommend keeping bath time to less than 5 minutes in a lukewarm bath, particularly during an eczema flare. Moisturize and moisturize! Using a product like Baby Pibu’s Hydrating Ointment helps to provide a protective barrier to keep baby’s skin hydrated and protected. Applying a moisturizer right after bath time helps to seal in the natural moisture that can be lost during bath time. Ointments are better than creams, and creams are better than lotions at locking in the skin’s natural moisture. Humidify the air. Putting a humidifier in your baby’s room is a must during winter time if your baby has eczema prone baby skin. During the cold and dry winter months, the humidity in the air can drop to <5% humidity whereas the humidity may be more than 25-50% during the summer months. More humidity in the air draws less moisture out from your baby’s skin, and this can help to prevent an eczema flare up. Use fragrance-free and hypoallergenic products. This includes pH-balanced cleansers. Fragrance is one of the top contact allergens in the testing of allergic contact dermatitis, so avoid it! Fragrance is there for us adult parents- our babies don’t care what they smell like. Choose products that carry the Seal of Acceptance by the National Eczema Association. 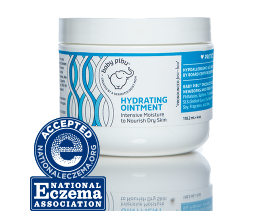 This seal of acceptance lets you know that the product has been clinically tested to be irritant-free and hypoallergenic. Eczema prone baby skin can be a challenge. We hope we have taught you more about how to identify, manage and prevent it. Enjoy your precious baby!